Play like a pro with the most popular playing cards in professional poker rooms around the world. 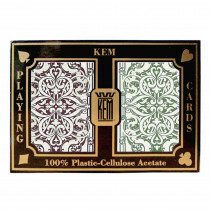 KEM plastic playing cards will outlast standard paper-based playing cards by up to 50 times! Plus, you get the durability and playability you would expect from a professional quality deck of playing cards. Kem cards won't wear out as quickly, won't tear easily, and can be washed to clean up any marks or spills. Just try that with your dimestore playing cards! Buy with confidence. 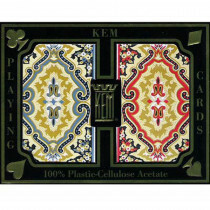 DK Gameroom Outlet is an authorized reseller of KEM playing cards. We buy direct from the manufacturer so you can rest assured you are getting top quality KEM cards with a full warranty. Don't be fooled by other sites that make you believe you are buying from KEM directly. KEM cards are only sold through retail dealers and distributors. Just because a website's domain name includes KEM, doesn't mean it is them.